Hartford Homes has welcomed the first residents to its Cronk Cullyn development in Colby, with several of the new family homes now complete. The local family-run building firm is over half way through work on the site which, once complete, will feature 59 contemporary homes including two-bed bungalows, three-bed terraced houses and four and five-bed detached homes. More than seventy percent of the properties at Cronk Cullyn are now sold, with the majority of those selling off-plan. This has meant many home-buyers have been able to personalise their homes before completion, from kitchen worktops and floor coverings to colour schemes. Nina said they took advantage of being able to customise the design and specifications at an early stage: “We knew from the outset that we would like to make some changes to the floor plan to suit our personal preferences. The Hartford team couldn’t have been more helpful in accommodating our requests and they were able to guide us towards making the right decisions based on their experience. There are still some homes available and current availability can be seen here. 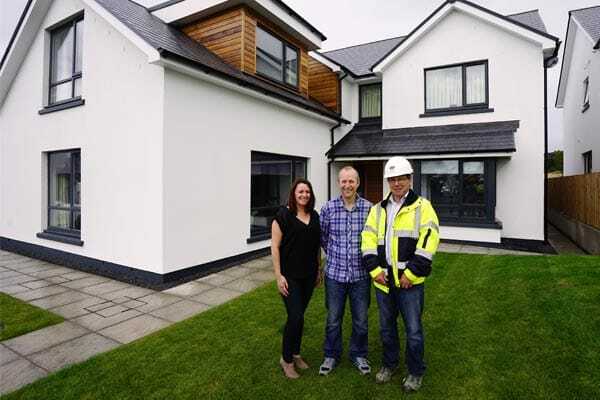 Photo: Cronk Cullyn first residents Nina and Dave Moore pictured outside their finished 5-bed home with Hartford Homes site manager Keith Featherstone.